Fishes hold a certain charm for angler. As the water creatures get baited in the equipment, this is the moment when the angler himself is in the baits of Nature and its characteristic sheer elegance. 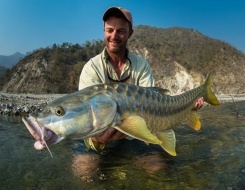 Angling in India is enjoyed in some of the best parts in and around the coastal area, but the river catches are just as much worthy or maybe more than that. Some rivers that are known for burgeoning population of Mahaseer are Beas, Kali and Kosi. At some distance from Corbett national Park is the place Bhikiyasen, which is renowned for angling Mahseer in River Ramganga. Add Asi Ganga, Dodital, etc to the list of angling regions and your hands and baits will be full of Himalayan Golden Trout fishes. 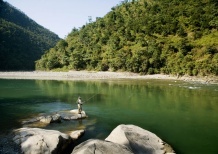 In Garhwal and Kumaon, tourists love indulging in catching big fishes. Here, as a part of the adventure tours, fishing can be combined with visiting wildlife with the opportunity to trek.